Ayrton Senna videos are typically a grand homage to the great man himself. They can be found all over the internet but especially on user upload sites such as Youtube. Ayrton Senna videos so popular? You will probably find more videos of Ayrton Senna on the internet than for any other driver. Like James Dean and Bruce Lee, Senna was a character and a hero cut down in his prime, thus immediately becoming an immortalised legend in memory and on celluloid. But much more than that, Senna has been described as the most “human” of drivers. More articulate than many native English speakers, driven by passion and a will to win, and always willing to express his viewpoint, Senna drove like a man possessed and this brought him many fans. 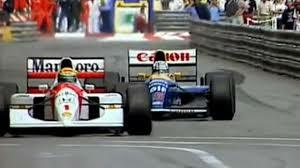 By far the greatest Ayrton Senna videos are those featuring his wheel to wheel battles with his great adversary, Alain Prost. These include the infamous incidents at Suzuka in ’89 and ’90, the war of words at Imola, the near pit wall accident at Estoril and the “hard but fair” tactics at Hockenheim. Other Ayrton Senna videos celebrate his first win at Brazil in ’91 in a broken car, his mastery of the wet at Donnington and sadly, his death at Tamburello corner. Ayrton Senna da Silva’s legacy lives on, in the joy and happiness that he brought to racing fans during his life, and in the legacy he leaves behind in the years since his passing away. You do not have to be a master to speak of mastery.